So, the UK election date was called today. On May 6th we go to the polls. No doubt the blogosphere’s crackling with comment, impassioned pleas, and a fair amount of cynicism, even apathy. Already the news teams are out interviewing Jo Public who are coming back thick and fast with comments such as those I heard on the news bulletin this lunchtime “whoever wins will line their pockets first”, and “they’re all the same”. 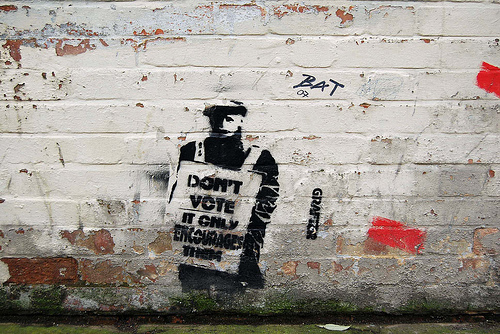 And once again I’m reminded of the old anarchist sayings “Don’t vote, it only encourages them” and “Whichever way you vote the government always gets in”. Will any of the parties make real lasting change that will take us towards a genuinely more inclusive, just and ecological society? I have my doubts. Not because of a lack of sincerity on the part of some politicians – I have too many good friends active in the Green Party to believe that. But because of a system itself which seems to grind idealism down under the vast historical weight of the status quo. Sure change is possible, but within tightly defined parameters or when it’s a choice of lose power or deliver change. But apathy? Doing nothing? It’s tempting. It’s so easy to be a spectator in today’s world. We can even interact by phone vote or twitter. But is it meaningful or does it provide just enough of a veneer of meaning to satisfy us and prevent us taking real action? Rhizome’s about activism – working with people and organisations to make activism more possible for them. For some that activism might involve the mainstream political process. For others it’ll be much more do-it-yourself. For some it’ll be a campaign to challenge an injustice through nonviolent direct action. Others will be building a positive alternative. And for a few it’ll be all of the above. Stopping airport expansion, starting a community garden, voting in a local election to keep the BNP out…all of these are vital to a vibrant, changing society. All of them need people to get up and make them happen. The alternative? Another 5 years of Brown-Cameron-Clegg or their sound-alikes talking about a better society whilst our experience of it gets worse. Each one of us has something we’d like to see changed. Why not start that process of change now. Sure, vote on May 6th if that’s your thing. But don’t leave it at that. There are 364 other days of the year needing you to make change in them. There are hundreds of organisations out there who can help you make change – whether, like us, it’s by sharing skills, or like 38 Degrees (see our upcoming interview with 38 Degrees director David Babbs) mobilising people to mass action. There’s your local Transition Towns group making sustainable change at a local level, or you might be lucky enough to have an autonomous social centre in your town . < What a difference a day makes? > NVDA – negative, violent, divisive and alienating?